We're too busy rushing around. Whether it's a social engagement, a work deadline, a long drive to visit family, or an urgent post on social media (telling people about one of the others), there's always something else we need to be doing or somewhere else we need to be, meaning we rarely get the chance to stand and stare. I'm certainly guilty of it. I'm not about to pour out a list of sins here (they'd only show me up as having a shamefully unimaginative social life) but I do have to confess to a booky instance of being in too much of a hurry. When on my way to this week's bookshop, I was in the middle of a long journey and a little tired and hungry, which meant rather than arriving in the town and taking my time to scout out parking, cafe, bookshop, etc, I rushed to the nearest Pay and Display space I could find. And because I was in a hurry I didn't read the big sign saying 'short stay, meaning I only had 25 minutes in which to explore. Meaning I very nearly missed out on a book I've long searched for. Warwick Books is within relatively easy reach of my parents, so it's somewhere I've often meant to visit but not quite achieved. Then it appeared in the Your bookshops section of this blog and I knew I had to make the effort. A beautiful blue shop front greets you as you arrive at this bookshop, which looks out onto what I imagine becomes a bustling market place on the right day. 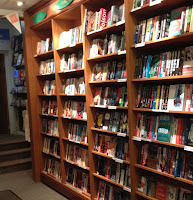 Entering, it feels quite open and spacious, with warm wooden shelves opening in front of you. Knowing I was limited for time, I merely glanced at the children's section to my right, and some of the non-fiction to the left, before noting a wall of fiction on my way to the first floor. Upstairs I found tea and coffee making facilities – how I wished I had the time to stop for a cup – as well as a comfy sofa and more of the non-fiction. Five minutes later I was back downstairs admiring the wall of fiction, noting the great variety on offer and thrilled to find a copy of David Mitchell's The Bone Clocks. Rushing over to the till, it was finally time to slow down, buy my book and take the time to say hello to the booksellers. Mog and Pauline are absolutely lovely. 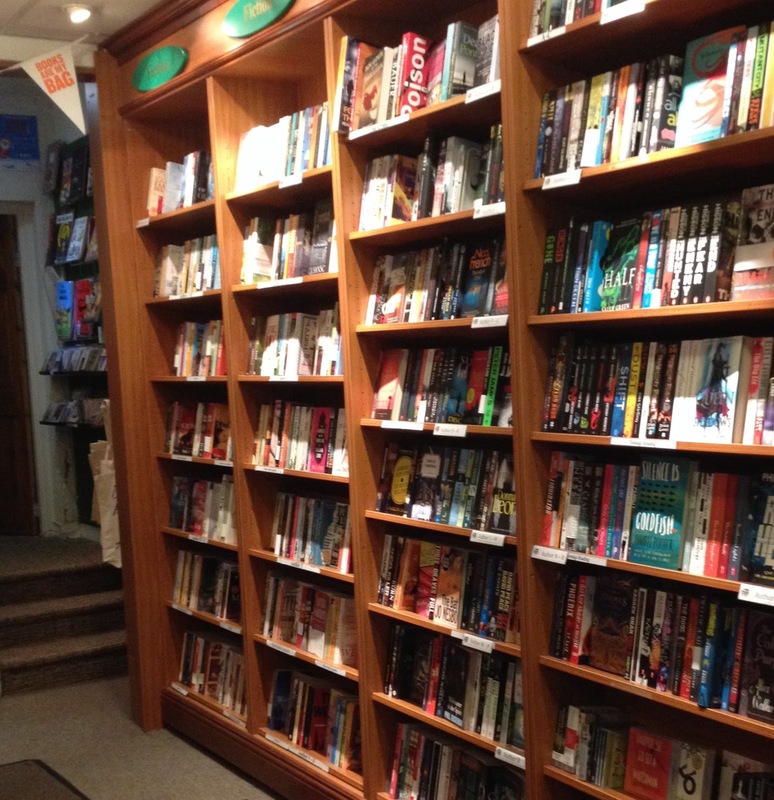 Exceptionally friendly and welcoming, they empathised with my parking plight (and advised me of better options for my next visit) and personally introduced me to their wonderful bookshop. From plans for the future (I'm looking forward to returning to see how their new shop front turns out), to book choices, they were sympathetically swift in their conversation while helping to make me wish I had more time. And this feeling was never more so than when they began talking about the children's section. Remember how long I spent there? 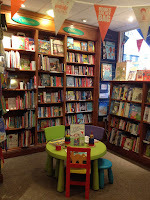 The bookshop has a beautifully revamped space for young readers and they're doing all they can to develop links with schools and encourage future generations. I'm not going to list everything here (it was a lot and all admirable) but their efforts do include encouraging the children to take part in reviewing the books they read. They then proceeded to pick out examples for me to see, and oh how I wished I'd taken the time to look at the children's section sooner, instead of rushing past... S F Said's Varjak Paw was one of the books picked out as an example of a young reviewer. Ever since I 'met' the author on Twitter and saw his efforts to support young reading I've wanted to read this book, even more so because who wouldn't want to read a book about a superhero cat? Here it was in front of me, but I have a one-book-per-shop rule, and I'd already made my purchase. Willpower was out the window and this second book was mine. Which pretty much sums up my feelings about Warwick Books. 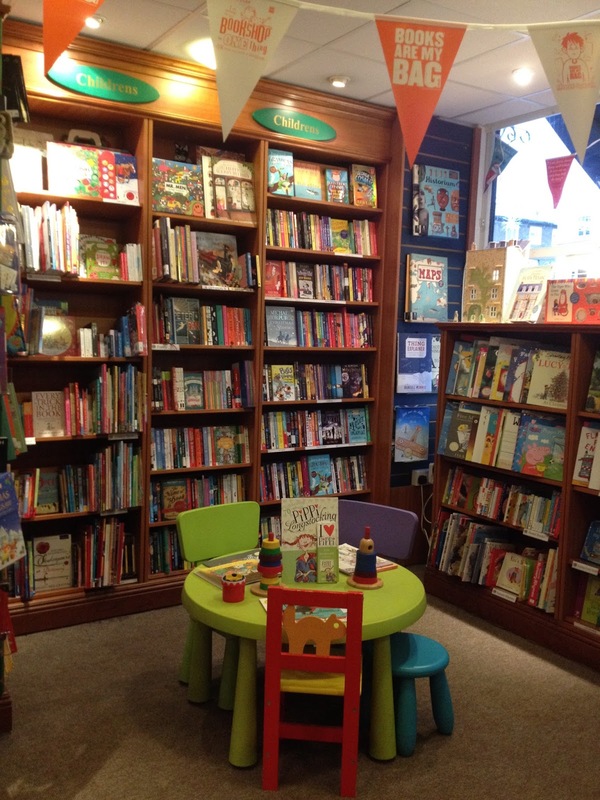 It's a gorgeous bookshop with an excellent offering for adults, but don't overlook the children's section – it's worth taking the time to explore. 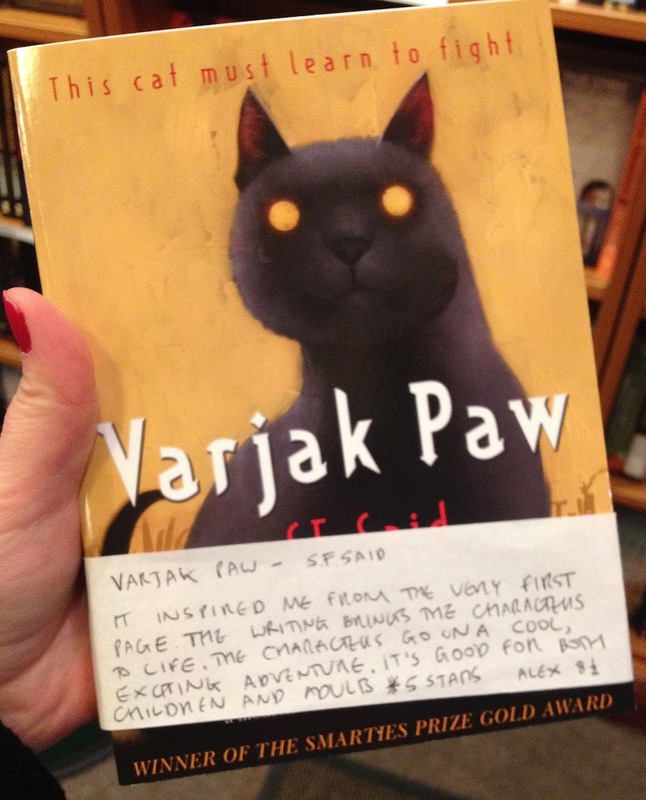 I thought about this Blog last week in Salisbury when I found a copy of Varjak paw in Oxfam in Salisbury where we went for the weekend. It was in the sale for only 50p which seemed a bit of a pity. Have to confess, I didn't buy it as I had already bought 2 old murder mysteries that weekend and my unread pile is currently over 30 books! There's no understanding the pricing of some places! At least this means the book's probably already in the hands of another reader. PS. Good work on the unread pile, mine grows much faster than I can read my way through it.